Published Wednesday, April 11, 2012, OK personal/derivative use; link www.lovethatimage.com. 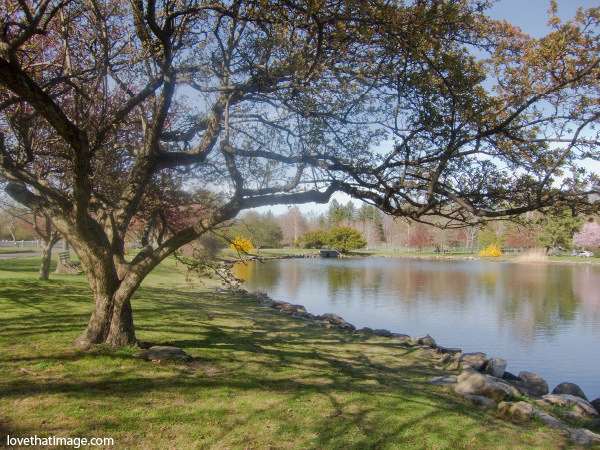 This spring scene of a tree near a pond was taken on my recent trip to Connecticut. Don’t you just love the pattern of shadows? The reflection of the spring flowers on the water surface isn’t too shabby, either. What a lovely day that was. I am so glad I always have my camera with me! Speaking of which, don’t forget to download the “7 Secrets to Better Flower Photos” at the right. You don’t need more than a pocket camera to take really nice pictures, is how I feel about it. You might enjoy Mellow Yellow Monday, Scenic Sunday, Shadow Shot Sunday 2, A Piece of Heaven, Skywatch Friday Watery Wednesday, Outdoor Wednesday, Weekend Reflections, and Wordless Wednesday. Please follow this blog on the new widget to the right if you enjoy the photos. Thanks for visiting! Such a pretty place! Happy WW! What a lovely place. Looks so peaceful. Super nice picture you show. Beautiful photo composition. Love it! Yes, a delightful spot to while away a pleasant day off. Thanks for sharing. Happy weekend. flowers gone for this tree. No birds or ducks? Another great shot. You have the knack, for sure.